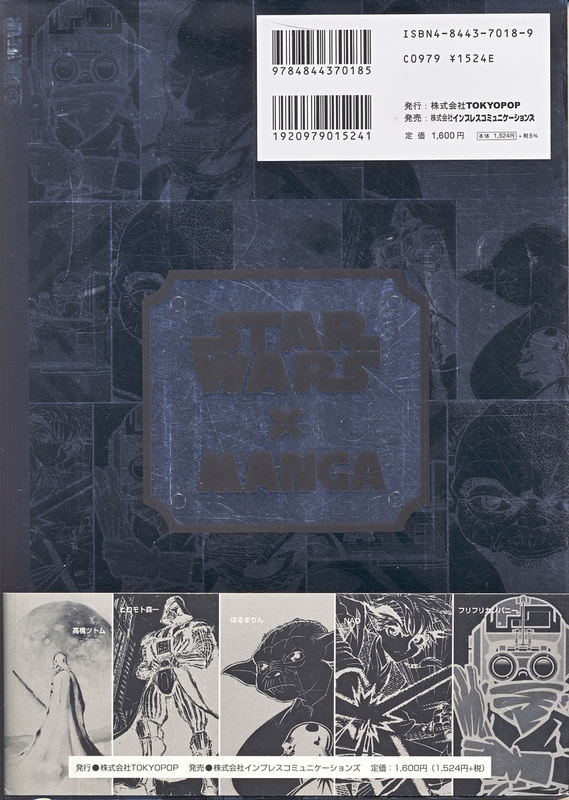 While Dark Horse held the Star Wars comic license in the U.S., Tokyopop published new Star Wars comics for a brief time overseas. The first comics published were the 7 Cine-Manga books for Japan, Germany, and the U.K. in 2005. These digest-sized comics are done in the fumetti or photonovel-style, with panels comprised of photos with text balloons and sound effects. Dark Horse published these photo comics for the U.S. market in 2007 and 2008. 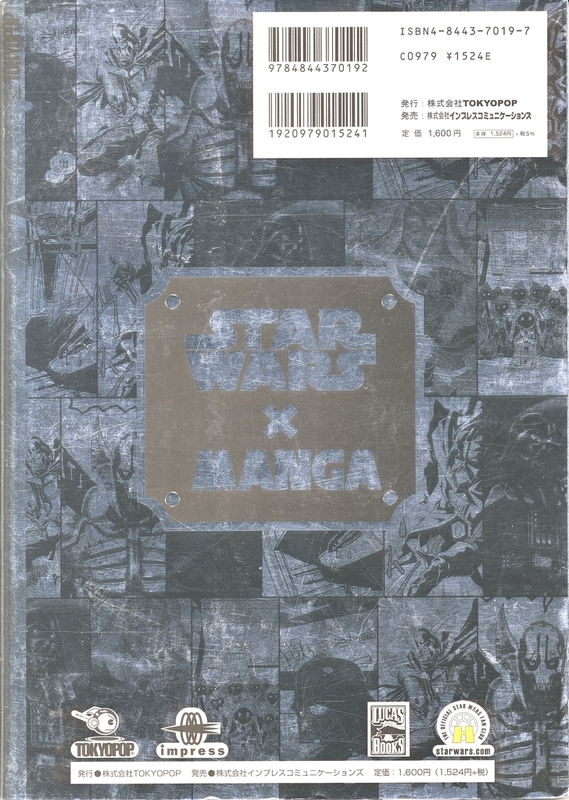 Tokyopop published 2 more Star Wars comics: Star Wars Manga: Black and Star Wars Manga: Silver. These comics were first released in Japan in December 2005. Both books were translated to English and released to the U.K. in October 2006. Since then, they have also been published in other foreign markets but never in the U.S. I'm guessing Dark Horse never published them in the U.S. because the photo comics sold so poorly. Each black and white anthology contains multiple stories drawn in the manga style. These books are slightly wider than standard comics measuring 10 1/4" x 7 1/4". The first page is a double-sided pull out poster which is in color. Both volumes have a dust jacket. The covers are flat, but the dust jackets have a shiny metallic coating, making them susceptible to scratches (as can be seen in the pictures below.) 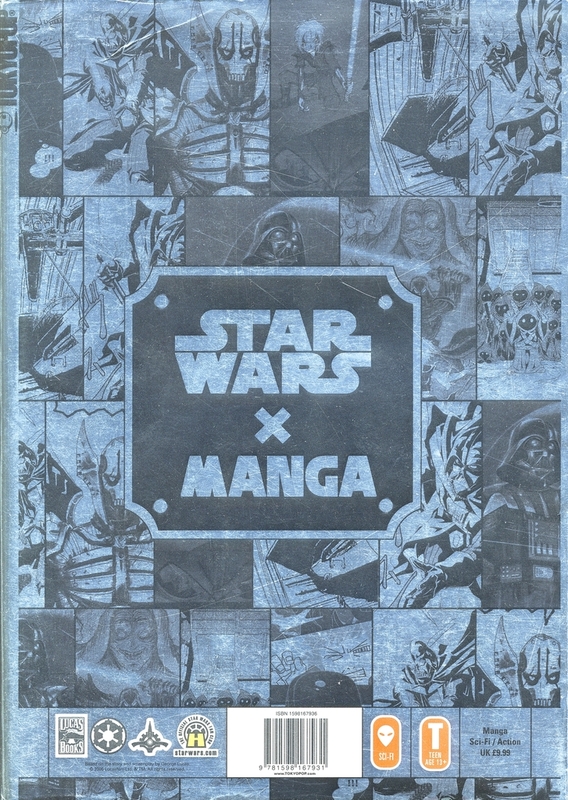 The two volumes are easily distinguished by the banner on the spine; Star Wars Manga: Black has a black banner and Star Wars Manga: Silver has a silver banner. 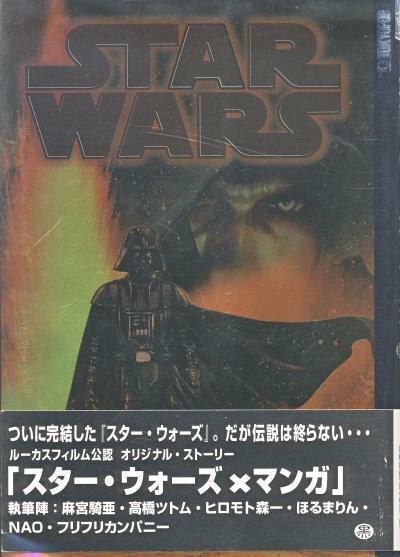 The black cover has an image of Darth Vader with a visage of Anakin Skywalker behind him. My copy has an obi, which is a paper strip wrapped around the bottom of the book with more information about the book. The back cover contains several panels with art from the stories inside the book. This book contains 4 stories. 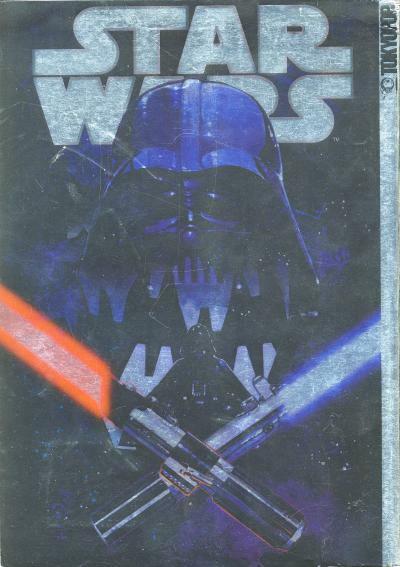 The silver cover has an image of Darth Vader sitting in his chamber with a visage of Vader in the background. In the foreground, a red and blue lightsaber are crossed. Like the black edition, the back cover contains panels with images from the inside content. The U.K. versions of these comics contain the same front cover, but the back covers are slightly different. The giant white UPC box in the upper right hand corner has been moved to a more modest sized box at the bottom of the cover, revealing more of the artwork. This book contains 5 stories. I apologize for the scans, but it is very hard to capture how these covers really look when held in hand. First of all, the scratches are not as obvious as the scans make them appear. Both the Japanese and British version of the back covers are actually identical in color, but I found it impossible to get the colors correct on the Japanese versions. The U.K. image above is the best representation of the color and look of these books in hand. Released on June 26, 2003, Star Wars Galaxies was the first Star Wars massively multiplayer online role-playing game (MMORPG). In the 8.5 years it operated, it saw three expansions. The Sony Online Entertainment game was shutdown on December 15, 2011 to make way for the 2nd Star Wars MMORPG, Star Wars: The Old Republic. 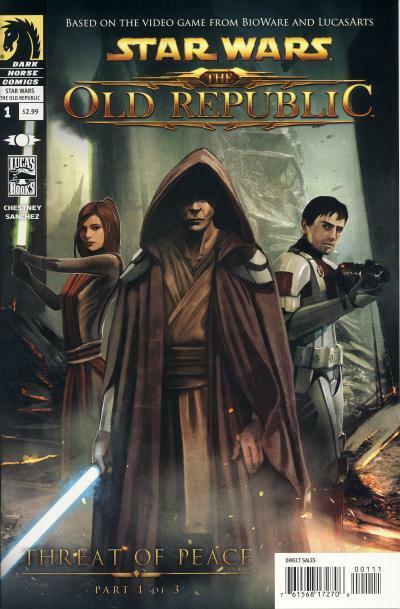 Released on December 20, 2011, Star Wars: The Old Republic quickly surpassed Star Wars Galaxies with approximately 1.7 million subscribers at the game's peak. The Bioware game is still active, having survived Star Wars' transition to Disney, although it's existence as part of canon or legends has not been formally announced. The sixth expansion was released in December 2016 called Knights of the Eternal Throne. To help promote the online game, three novels and two comic mini-series were published before it was released. After the release, another novel was published. 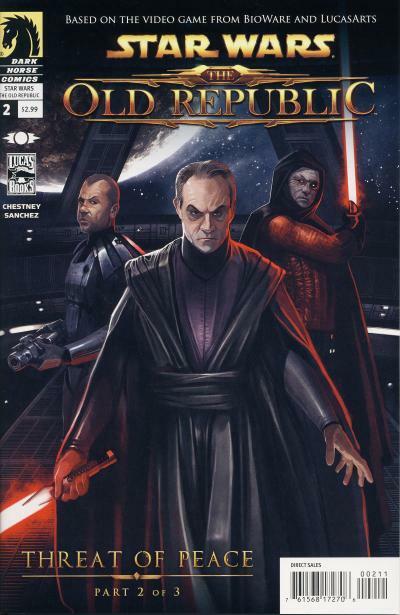 The first Dark Horse 6-part mini-series is comprised entirely of formerly published web comics released on StarWarsTheOldRepublic.com from February 27th, 2009 through September 24, 2010. An "ashcan" was given away for free at the Dark Horse booth at the 2009 San Diego ComicCon. It has a chromium cover and measures 6 1/2" x 4 1/2". The cover artwork is by the interior artist Alex Sanchez. 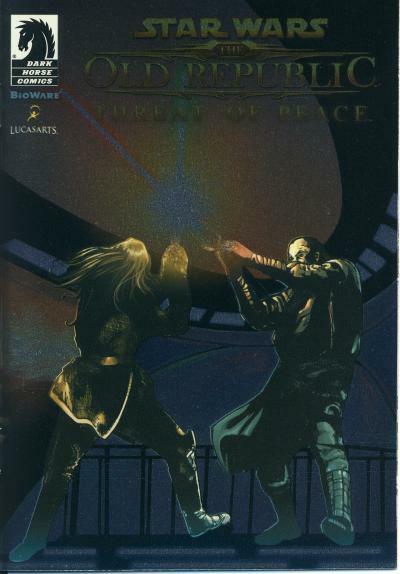 The first three issues make up the Threat of Peace arc. The first issue has a variant cover. The final three issues make up the Blood of the Empire arc, which chronologically takes place before the story in Threat of Peace. The covers by Benjamin Carré are decent. 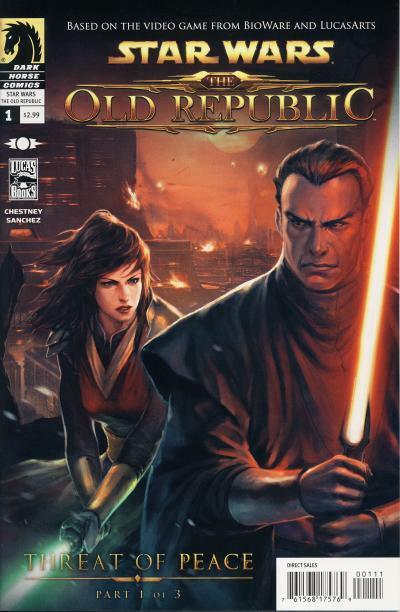 The best cover is found on the variant for issue #1; it is done by ATTIK, an advertising agency that has provided other work for The Old Republic game. The covers are much better than the interior artwork. Alex Sanchez is a capable artist, but his style is not to my liking. His line work is clean, but most of his panels look flat, providing no depth by way of shadows. This makes it appear like the characters are suspended in space, not interacting with their surroundings. His art reminds me of the work found in a coloring book. To be fair, some of the blame for the lack of depth to the art should also fall on the colorist and undoubtedly the short deadline Sanchez had to work under. Star Wars #1 was an instant sellout in January 2013 and Dark Horse went back to print three more times to satisfy the demand. 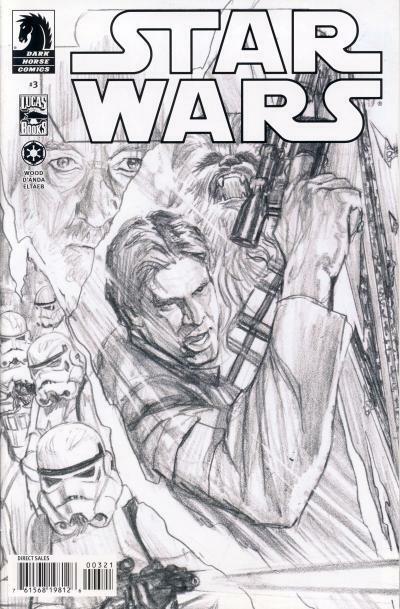 To celebrate the success of this title, sketch covers for the first four issues were distributed to retailers. The covers for all four issues are drawn by Alex Ross. 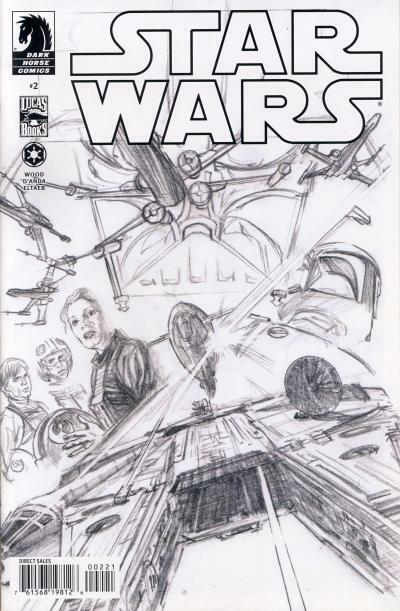 Several of these sketch covers have differences from the final artwork used, giving fans a brief glimpse into the creative process. The year is off to a HUGE start, as this week saw the release of what is not only one of 2013’s most anticipated Star Wars comics, but also one of the most-talked-about comics launches of the year overall! To add to the excitement, Dark Horse announces today that it will produce special variant covers for Star Wars #1-#4, which will be consecutively tied to issues #4-#7. These special variant comics will feature artist Alex Ross’s original cover sketches! This all-new Star Wars series is set in the time period of the original trilogy, specifically directly following the events of Episode IV: A New Hope, and features the franchise’s best-loved characters, as told by Brian Wood (X-Men, DMZ, Conan the Barbarian, The Massive) with art from Carlos D’Anda (Batman: Arkham City). This is Star Wars as you remember it . . . and as you have never seen it before! Dark Horse is taking you back to those heady, adventure-filled days following the destruction of the Death Star-when the Empire ruled, the Rebels were on the run, and the galaxy was a dangerous place where anything might happen! Retailers, look for specifics on how to order these soon to be highly sought-after issues in Diamond’s Previews catalog! Fans, make sure to tell your local retailers that you’re on board for this blockbuster series, and these exciting variant covers! Look for Star Wars #1 on sale at finer comics shops everywhere now! I've included the original press release because the details are vague on how these sketch covers were distributed to retailers. My recollection is these were distributed at one to a retailer, but I've been unable to find any official word on that. If anyone knows definitively, please let me know! The Comics Chronicles released the January 2017 estimated sales on Monday. The top selling book was Marvel's U.S.Avengers #1 which had the benefit of 54 state variant covers but still only managed to ship an estimated 110,729 units. This was followed by DC's Batman #14 and 15 in 2nd and 3rd place which both also saw units of over 100,000 copies. Everything else shipped less than 100,000 units. 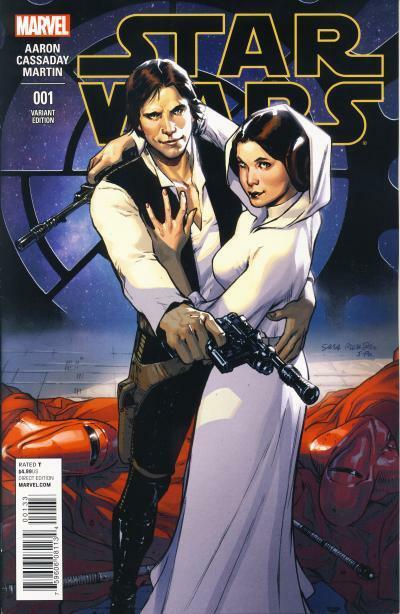 Star Wars #27 was Marvel's 2nd best selling ongoing title, not including #1 issues, behind Amazing Spider-Man #23. January's chart is notable because Marvel over-shipped their entire line by 10%. This means U.S.Avengers took the top spot for units distributed, but only because of the over-shipping. Last month, I corrected the mistake I made explaining that Star Wars #26 increased sales due to it being the first arc starring Yoda. That is made very clear in January with the units shipped slipping by over 32,000 and that is with a 10% overage. 10% is not insignificant, so approximately 66,000 copies were ordered by retailers and the other 6,000+ copies were given to retailers free by Marvel. Star Wars #25 had estimated sales of 75,234 units. Clearly Marvel's over-shipment program is intended to hide the declining numbers as the Star Wars title shed approximately 9,000 units in 2 months. Unfortunately, things do not look better for the Doctor Aphra title which saw a decline of almost 13,000 units. With the 10% over-shipping, approximately 44,000 copies were ordered by retailers, meaning Doctor Aphra saw orders slip by approximately 17,400 units from December. Doctor Aphra replaced the Darth Vader title and Darth Vader #24 sold approximately 75,401 units. This means Doctor Aphra is under-performing the Darth Vader title significantly. In fact, Doctor Aphra #3 is under-performing every Star Wars title's 3rd issue, ongoing or mini-series, except for The Force Awakens #3. It is a good bet this was not Marvel's intent when they replace Darth Vader with this title and I will be surprised if this title sees more than 12 issues. The one bright spot is the Poe Dameron title, which saw over 1,000 more units ship in January over December. Granted, if it was not for the 10% overage, the title would have ship just over 36,000 units which would have actually be a decline from month-to-month, but a much smaller decline than the other two Star Wars ongoing titles. In February the Darth Maul 5-part mini-series began and in April we will get the first issue of the Rogue One movie adaptation. Marvel is wisely using a crossover event in May to boost sales. That month, the Star Wars and Doctor Aphra crossover event, The Screaming Citadel, begins. Like Vader Down, this crossover should provide a much needed boost to both these ongoing titles. There is much consternation over Marvel's declining sales. Their over-shipment program the past 2 months has effectively glossed over the problem and if these 2 months prove to be a blip for Marvel, that would be great. While it is nice to see Marvel send out copies of their comics for free to retailers, I hope the gesture is not in vain and these extra copies result in increased readership across their line. The average sale per issue of 53,671 would rank 27th on the top 300 chart for the month of January. Star Wars trade paperbacks, reprint titles, and reorders are not accounted for with these numbers. The Star Wars trade paperbacks are strong sellers. Take a look at the Star Wars Sales Estimate Chart and please read the blog posting January 2017 comics sales estimates online; overships visible in charts (without affecting much) . Is Star Wars #70 a Batman #9 Homage? 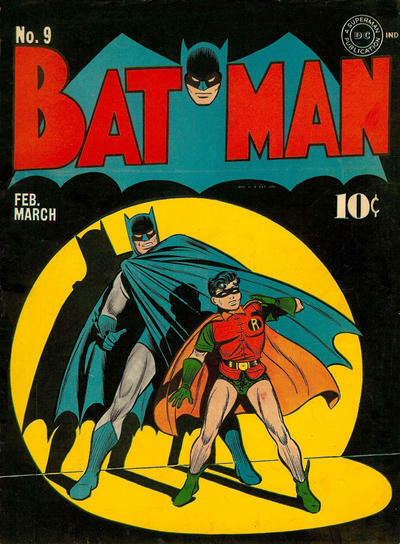 The cover shows Batman and Robin in a yellow spotlight against a black background. Both appear to be startled as Batman lifts his cape to cover himself while Robin does the same with his hand. It is a simple, yet powerful image, and it is easy to see why other artist would reference this classic artwork. Whenever I see the cover for Star Wars #70, I am reminded of Batman #9. 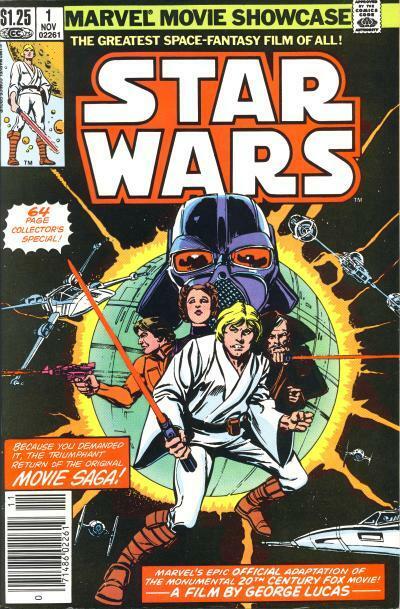 The cover has the main character, Luke Skywalker, Princess Leia, Han Solo, Chewbacca, C-3PO, and R2-D2 in a red spotlight. The background is a pockmarked side of a building and a shadow in the foreground portends an approaching menace. While none of the characters have a cape to lift, they do look startled and both Leia and C-3PO have their hands raised. I'm inclined to believe this is a homage to Batman #9 despite the myriad of differences. The spotlight appears to be coming from the same angle, the background is sparse, and the characters are startled. It might not be overt, but I believe the artist Tom Palmer, at least subconsciously, reference that classic cover when creating this artwork. What do you think? Is the cover for Star Wars #70 a homage to the Batman #9 cover? 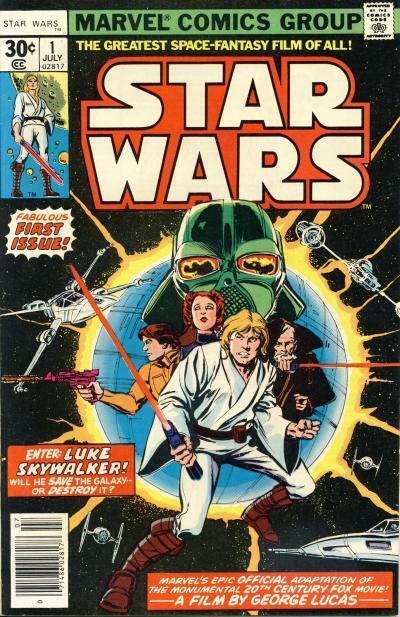 It is fairly common to see a listing of a reprint of the Star Wars (1977) #1 comic asking for 1st print prices on eBay. For non or novice comic collectors, this mistake makes sense; there are five different versions of Star Wars #1 and only the newsstand and $0.35 editions can be considered 1st prints. Identifying two of the three reprints is fairly trivial since the word REPRINT is written in the upper left hand corner of the cover in the character box. The other reprint is slightly harder to identify as it would require reading the indicia on the first page or understanding the nuances of the diamond price and UPC symbol boxes. 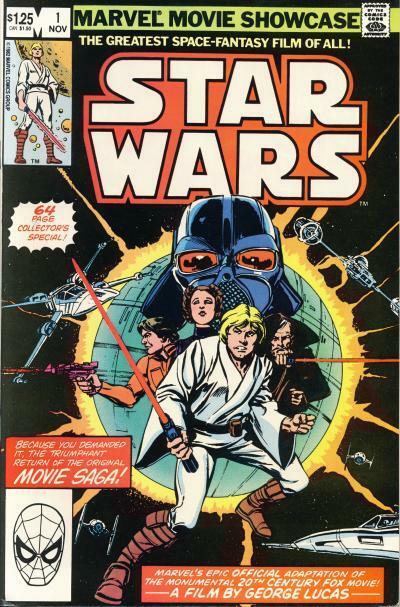 It is also common to see Marvel Movie Showcase #1 being misidentified as Star Wars #1, usually with an incorrect description saying the comic was printed in 1977.
star burst text reads: Fabulous First Issue! star burst text reads: 64 Page Collector's Special! text blurb reads: Enter: Luke Skywalker! Will he save the galaxy-- or destroy it? text blurb reads: Because you demanded it, the triumphant return of the original movie saga! In 2015 it was estimated that 14% of the U.S. population spoke Spanish or approximately 35 to 40 million people. Not surprisingly, Spanish has been the fastest growing language in the U.S. Comic publishers, who are eager to diversify their fan base, recognize the potential for selling Spanish language comic books in the U.S. In December 2007 Marvel published the Fantastic Four: Isla de la Muerte! one-shot in both English and Spanish. DC followed up in April 2008 with a gimmick for Blue Beetle #26 which was published in Spanish and included the English script. Jaime Reyes, the Blue Beetle, is Hispanic and, in the story, Reyes and his family are conversing in Spanish. 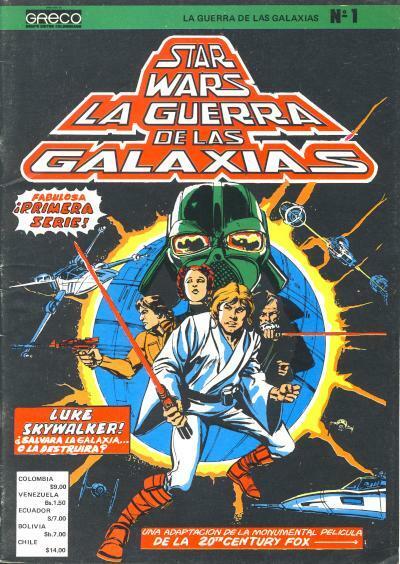 Before Marvel and DC's foray into Spanish language offerings however, Dark Horse had reached out to the Spanish speaking demographic in the U.S. with three Star Wars comics in June 2006: the digest-sized graphic novel La Guerra de los Clones Aventuras #1 and trade paperbacks La Guerra de los Clones: La Defensa de Kamino and El Imperio: Traicion. These Spanish versions of previously publish English language comics did not sell well enough for Dark Horse to continue the initiative. 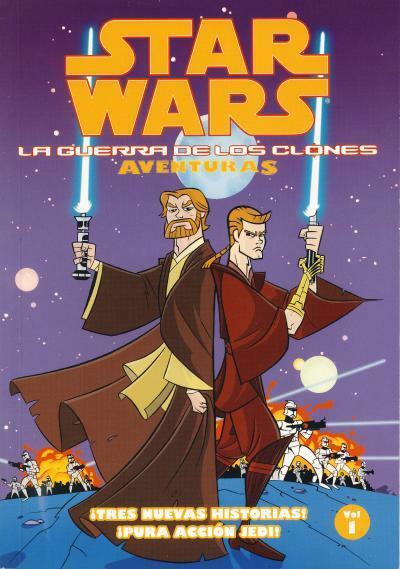 The original English version of La Guerra de los Clones Aventuras #1, or Clone Wars Adventures #1, was published in July 2004. This 96-page book contains three stories based on the Genndy Tartakovsky's Clone Wars micro-series. 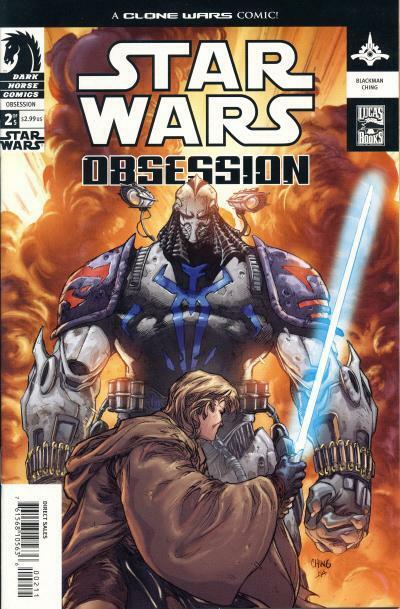 The aesthetics of the cartoon are captured in the artwork, including on the cover, and there is no mistaking this as a tie-in for the later, longer running The Clone Wars animated series. For a long time, this Spanish-language graphic novel languished in back-issue bins and online comic shops. A copy of this comic fetches cover price or less. Marvel has gone back to print on several Star Wars issues with the latest being the 2nd prints for Darth Vader #20 - 23 a few months back. Most of the reprints have been fairly easy to find, but there are a few that have been elusive. Marvel usually has only gone back to print when there is a demand for an issue, which is why there have been ample supplies of the subsequent printings. 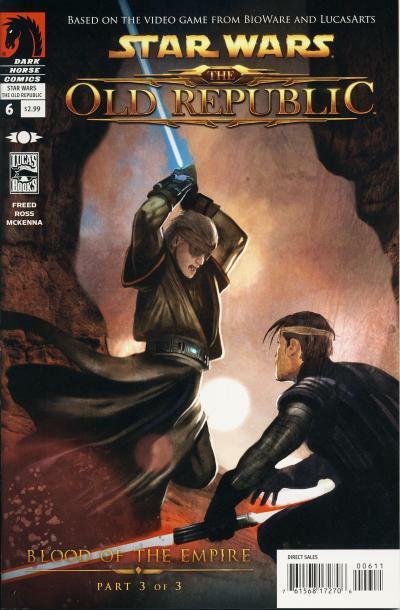 This is not always the case however and one of the harder to find reprints is the 2nd print of Ob-Wan & Anakin #2. 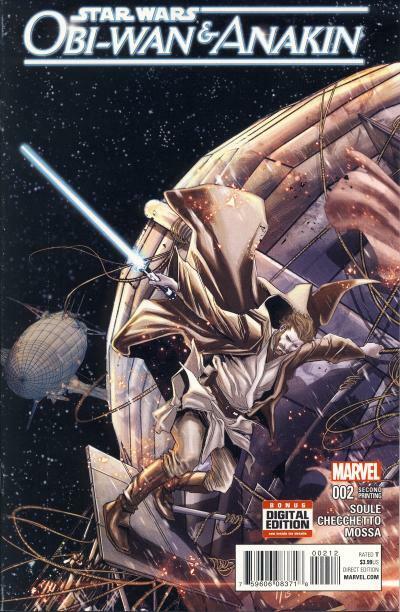 The cover for the first printing of this issue shows Obi-Wan Kenobi battling airships on the war ravaged planet Carnelion IV. The planet is covered in snow which is why the background has a lot of white. This gives the perception we are looking down at Obi-Wan. The 2nd print cover is the same art, except the background has now been replaced with a star field. This gives the perception we are looking up at Obi-Wan. The airship in the upper left hand side of the comic has been removed to complete the illusion. Currently, there are no 2nd prints of this issue available on eBay and there has been no copy for several months now. When they do appear, they go for around cover price. If you are like me and want to own as many different Star Wars issues as possible and appreciate the thrill of the hunt, acquiring one of these copies should provide a slight challenge without costing much. When Marvel reacquired the license for Star Wars comics, they capitalized on the excitement by releasing over 70 different covers for the first issue in January 2015. None of the covers are directly applicable to the story inside the issue, but that is normal for comics from Marvel these days. Since the covers contain a wide range of iconic images from the original Star Wars trilogy, it would only be natural for at least one of these covers to focus on the romantic relationship between Han Solo and Princess Leia. Sara Picelli provide the artwork for one such cover. This variant was initially distributed in a 1:20 ratio to the standard cover. This need to publish so many variant covers has definitely led to some interesting and impractical pieces. On this cover, Han and Leia are together with weapons in hand after presumably taking out a squad of the Emperor's Royal Guards. To add to the intrigue, the window in the background suggests they are on the Death Star II. It is a strange cover not based on any scene from any of the movies, made even more bizarre by Han and Leia posing for a photo op! Sara is an able artist and it is unfortunate someone at Marvel didn't do a better job reviewing the artwork that was submitted. 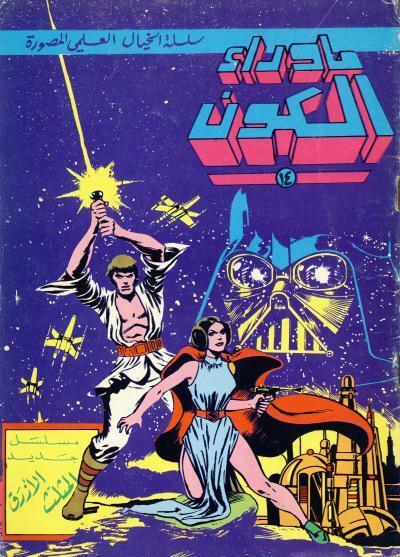 The Star Wars movie adaptation was translated to Arabic by publisher Bissat El-Reeh or Flying Carpet. 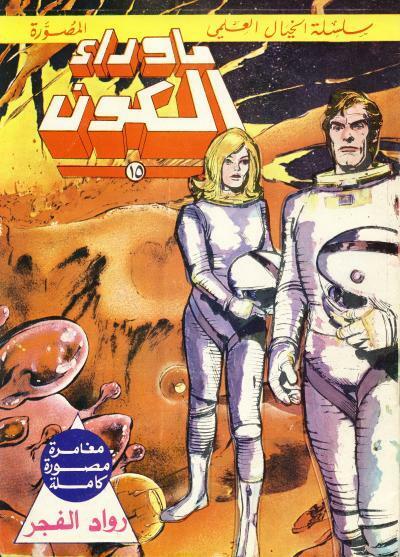 The Arabic version first appeared in the science fiction anthology title Beyond the Universe in issues #11 - 16. 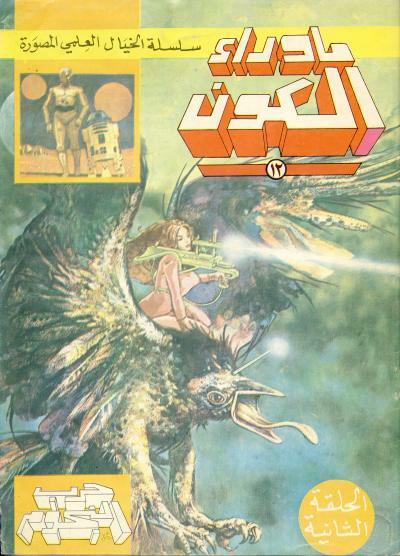 Flying Carpet published comics in Lebanon during the civil war, making it astonishing copies of this series survived. 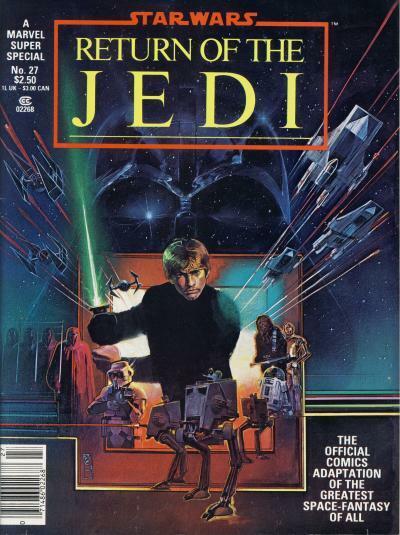 Issues #12, 13, and 15 have non-Star Wars covers, although issues #12 and 13 show small Star Wars images on the cover. Fans of Space 1999 should recognize Commander John Koenig and Doctor Helena Russell on the cover of #15. 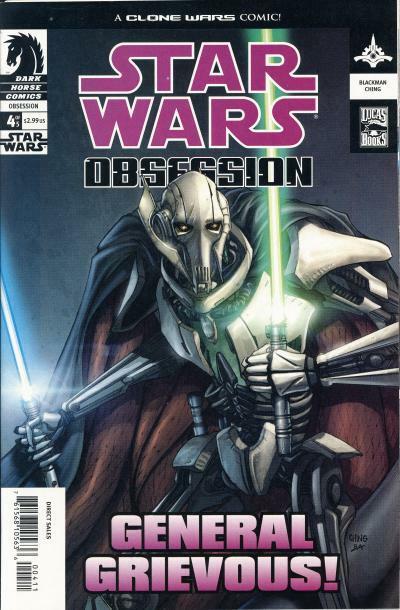 The cover for issue #14 uses the cover artwork from Marvel Super Special Featuring Star Wars #1. Some of the color choices are interesting when compared to the original cover, such as Luke Skywalker's belt, and Princess Leia's gown and cape. 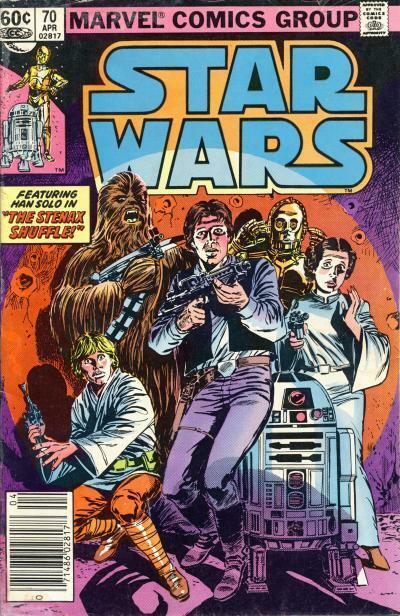 The main artwork on the cover of issue #16 is from Marvel Super Special Featuring Star Wars #2. Many times when early copies from this series show up for sale, it is apparent they are ripped from a Beyond the Universe Album. The biggest giveaway is how rough the spine is and many times the pages are loose. When these issues are bound into the Beyond the Universe Album, they are also trimmed so unbound issues are slightly larger than the copies that are removed from the albums. I want to thank N. Scott Robinson from Globo Cómico for helping me acquire these beautiful unbound copies! Scott has been very helpful in providing information on these Lebanese comics as well as other foreign Star Wars issues I own. 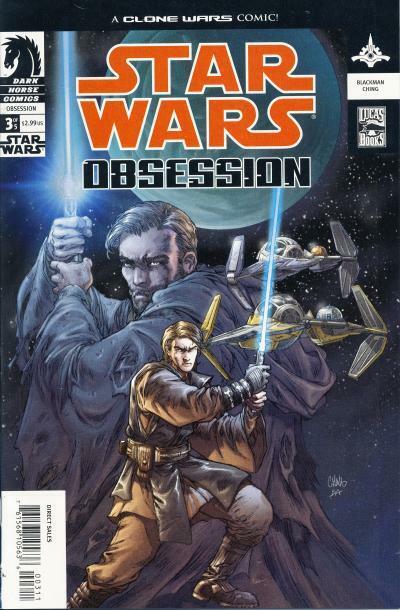 Star Wars: Obsession is a 5-part mini-series that is a lead-in to Revenge of the Sith. 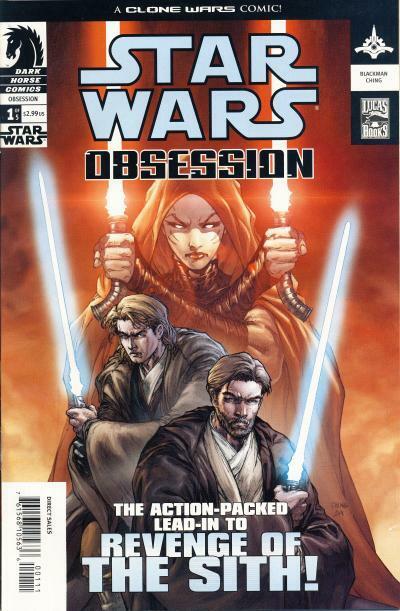 In the story, Obi-Wan Kenobi is obsessed with finding Asajj Ventress, who the rest of the galaxy believes was killed by Anakin Skywalker, but Obi-Wan knows is alive. After learning about her tragic origin, Obi-Wan believes she can be saved from the Dark Side. The story starts on the planet Trigalis where Obi-Wan meets Jedi Master Aayla Secura who tells him where to find Xist, a Black Sun agent, who might be able to help Obi-Wan on his mission. After being defeated in combat by Obi-Wan, Xist reveals one of Count Dooku's agents is in the Karthaak system. Obi-Wan enlists the aid of a reluctant Anakin and near the planet Maramere, they encounter a derelict starship. Aboard the ship Anakin Skywalker battles and kills Durge by guiding an escape pod containing him into the Karthaak star, foreshadowing Anakin's eventual dispatching of Dooku in the movie. The pair are picked up by a Republic Star Destroyer, the Intervention, and learn another Dooku agent is on the graveyard planet Boz Pity in the Outer Rim. The Republic discovers a large Confederate base at Boz Pity and attack with the assistance of many Jedi stationed in the Outer Rim. Anakin crash lands the Intervention on the surface of the planet and a ground battle ensues. Both Dooku and General Grievous are on the planet and during the battle, Grievous kills Jedi Master Adi Gallia, but Jedi Master Mace Windu injures Grievous. On the base, Obi-Wan finds Ventress in a Bacta tank and she attacks him. Dooku has his droids retrieve Grievous and orders his troops to kill Ventress. Ventress is injured by Dooku's droids and when Obi-Wan tries to help her, she attacks and Anakin cuts her down. In the prologue, a shuttle is returning Ventress' body to Coruscant for burial, but it turns out she is alive. She commandeers the shuttle and orders the pilots to take her far from the war. 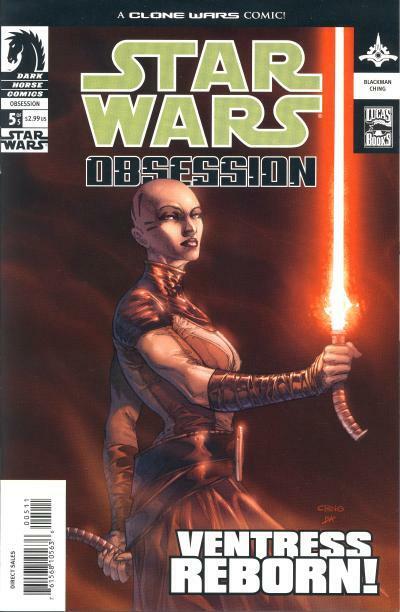 This story is used to account for Asajj Ventress' and Durge's absence in Revenge of the Sith. The injuries caused by Windu also explains Grievous cough although another explanation is shown in the 2003 Clone Wars cartoon. Additionally, Adi Gallia dies again under different circumstances in the 2008 Clone Wars animated series. This mini-series has commanded higher than cover prices since it was released. Individually, issue range from $5 - $10 and the entire set, in near mint condition, fetches from $25 - $40 on eBay. Between 1983 and 1986 Federal Publishing Company published U.S. comics under the Federal Comics imprint for Australian readers. 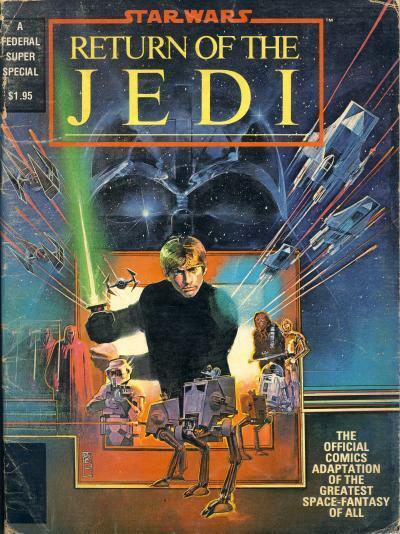 They published the Return of the Jedi movie adaptation in 1983 based on Marvel Super Special #27. Both the front and back covers artwork is the same as the Marvel Super Special edition. In the upper left hand corner, a black box with the text A Federal Super Special replaces A Marvel Super Special No. 27. Additionally, the price has been changed from $2.50 USD to $1.95 AUS. In the lower left hand corner the UPC symbol has been replaced with a black box. Unlike the U.S. version, the Australian issue has a thicker, cardboard cover stock. Another fan-made Star Wars comic has popped up on the web called A Star Wars Comic. From the looks of the site, we can expect a new 6-page comic on the 25th of every month and so far A Star Wars Comic: Two Tubes has been released. It is going to be an anthology series and the artwork is worth checking out! Patterned after Vader Down, the Star Wars and Doctor Aphra titles will crossover in an event called The Screaming Citadel, a gothic-horror tale where Luke Skywalker teams up with Aphra. The 5-part story kicks off in Star Wars: The Screaming Citadel #1 with part 2 taking place in Star Wars #31 and part 3 in Doctor Aphra #7. Presumably Star Wars #32 and Doctor Aphra #8 will complete the crossover. The learn more about this event, please visit the official Star Wars website and read Exclusive: Kieron Gillen and Jason Aaron Reveal Marvel's Star Wars: The Screaming Citadel Crossover. Zavvi is an online brand that, through the usual tangled web of acquisitions and bankruptcy, is a descendant of Virgin Megastores. Zavvi is based out of the U.K. although they have expanded into other countries. They sell a subscription box service called ZBOX that contain themed pop culture products, including comic books. The December 2015 ZBOX offering was Star Wars themed due to the release of The Force Awakens that same month. Included in the box is an exclusive Star Wars: Vader Down #1. While ZBOX is now available in the U.S. it was not at the time this exclusive was released, so most of the sales found on eBay are from the U.K. The cover art is by Pasqual Ferry who also provides covers for the Star Wars (2015) #1 Think Geek and Star Wars: Shattered Empire #1 Baltimore Diamond Retailer exclusives. Like the Think Geek exclusive, this artwork looks rushed and subpar when compared to other Vader Down #1 covers. Ferry's style tends to be cartoonish and sometimes it works like on his Shattered Empire #1 exclusive cover. 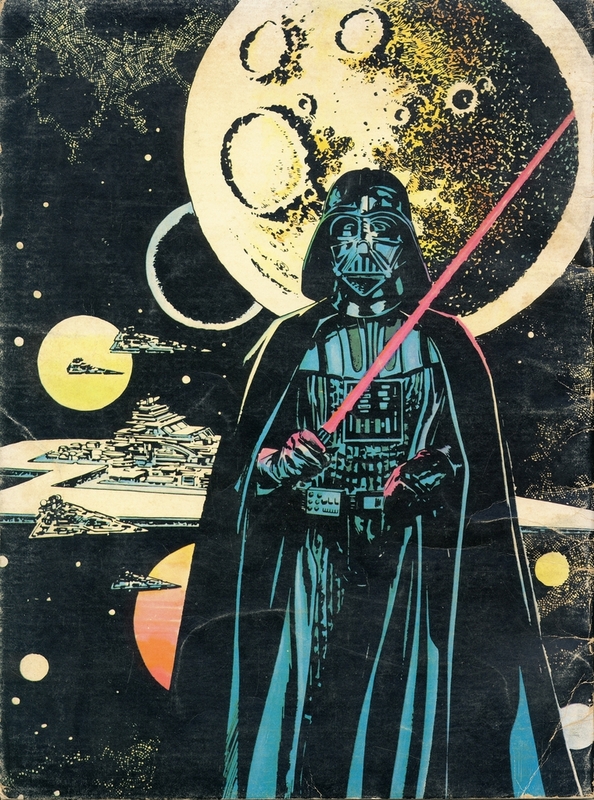 On this cover, Darth Vader is stylized but hefty and easily the best part of the artwork. To the right of Vader is Han Solo and R2-D2 racing down a corridor and to his left are 0-0-0 and BT-1. BT-1 is poorly drawn with a squat body. Above Vader are floating heads of Princess Leia, Black Krrsantan, and Luke Skywalker. Below Vader are X-Wing Fighters chasing his TIE Advanced Starfighter. Either the scale is off or the X-Wings are firing below Vader's TIE. Another problem is the X-Wings have their S-foils closed instead of open for combat. This cover is up there with some of the worst covers produced in the modern Marvel era. 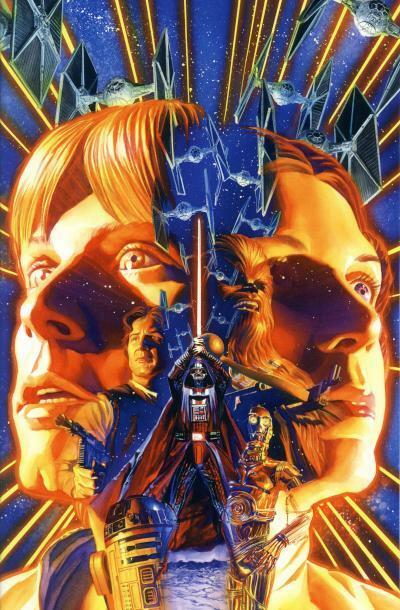 The first Star Wars poster, distributed at the 1976 San Diego Comic Con, uses an art technique called a montage. Many other Star Wars posters use the same technique, juxtaposing people, aliens, space ships, and locations usually with a focus on the main characters. These posters have been used to convey action, adventure, and even romance. Montage movie posters are ideal for a property like Star Wars which is steeped with imaginative imagery, because they cram a large number of images that otherwise wouldn't co-exist into one appealing piece of art. 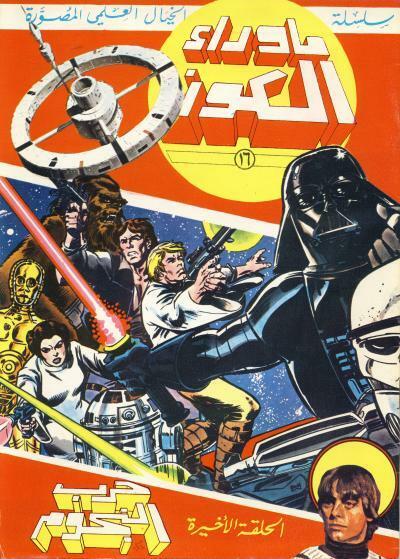 The first Marvel Star Wars comic book cover is also a montage. 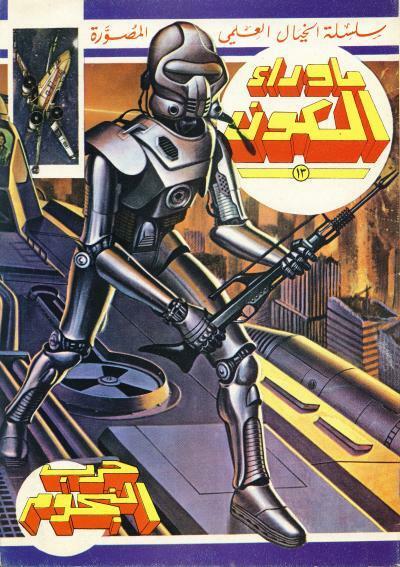 Not every comic cover from the original series uses the technique however; many covers simply depict a scene from the story inside, even if the action on the cover is misleading. Over the years, comic book art has progressed and so has the montage artwork produced for covers. 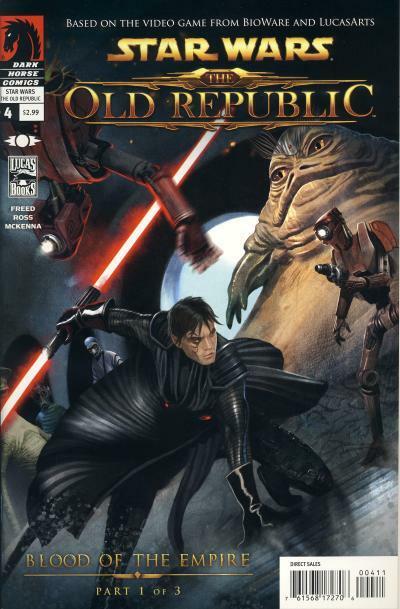 In fact, since Marvel has mostly moved away from covers based on the content to more generic images, several montages have been created for Star Wars comics. Assuredly, some artists who produce these covers are fans and are nostalgic for those classic movie posters. In my opinion, many of these covers are just as gorgeous and could be posters themselves. As a thank you for the success of this comic, Dark Horse sent retailers a sketch variant cover. The piece is an inversion of the famous Tom Jung/Hildebrandt Brothers posters. Instead of Luke Skywalker holding the lightsaber high above his head, Darth Vader is now in that pose. Additionally, Luke and Princess Leia provide the ghostly visage instead of Vader. Another brilliant touch is the swarm of TIE Fighters replacing the X-Wing Fighters seen on the poster. The sketch variant shows a step in the process Ross used to create the montage and there are some interesting modifications between the sketch and the final cover. C-3PO and R2-D2 are switched on the final cover, with R2-D2 under Luke's visage and C-3PO under Leia's. I believe this was done because the placement of C-3PO on the original cover makes it look like he is holding the blaster in Han Solo's hand. Another, more subtle change is with Chewbacca's bowcaster. In the sketch, the end of the bowcaster is uncomfortably close to Leia's nose and in the final piece, it has been lowered. The end result is an extraordinarily beautiful cover that alone is worth owning this comic. 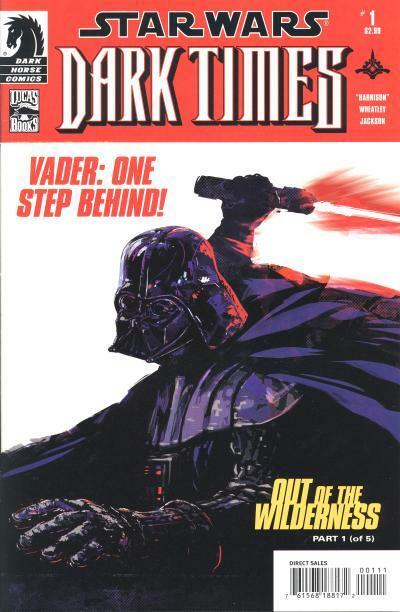 To say that Star Wars: Dark Times had an erratic publishing schedule is an understatement. Only 33 issues were released over a 7 year period! Douglas Wheatley provided the art on many of the issues and his work is very meticulous and detailed. Despite the huge delays between issues, many fans stuck with the series because of their appreciation for Wheatley's artwork. After the 17th issue, Dark Horse went with the mini-series within a series approach with the Dark Times title, allowing them to release new #1s for each story arc as well as give Wheatley time to work ahead before soliciting the next arc. Only 3 arcs of 5 issues each were published in this manner: Out of the Wilderness, Fire Carrier, and A Spark Remains. 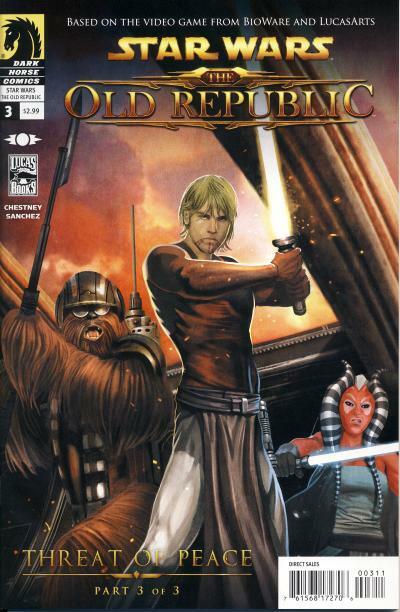 During this period, Dark Horse was releasing variant covers for their first issues, although their output of variant covers was not close to the egregious pace that Marvel would use when they recaptured the Star Wars comic license. 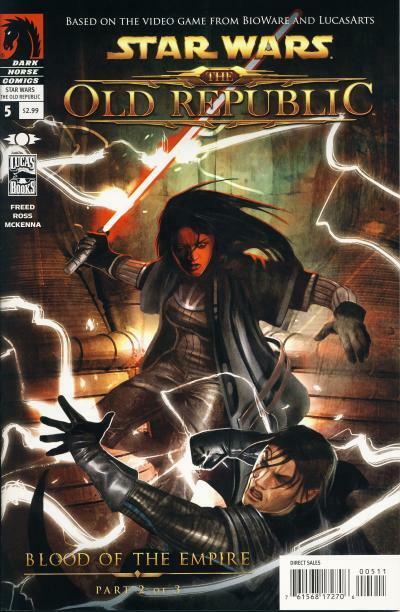 Most of Dark Horse's Star Wars variant covers were initially released with a 1:5 ratio making it inexpensive and easy for collectors to purchase them. 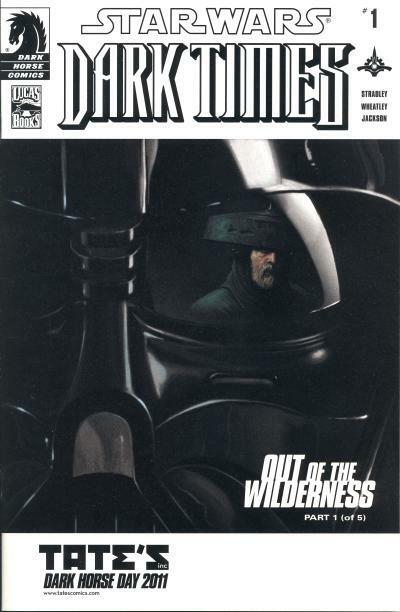 Dark Times - Out of the Wilderness #1 has both a standard cover and a 1:5 ratio variant cover. 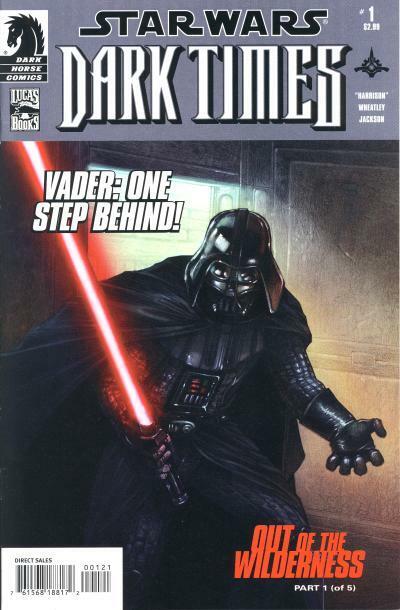 Both covers feature Darth Vader wielding his lightsaber. Tate's Comics is a large comic and pop culture retailer that operates in Lauderhill, Florida. On August 13, 2011, Tate's Comics hosted Dark Horse Day and had several Dark Horse staff at their shop to greet fans and sign comics. Attendees included: Randy Stradley the senior Star Wars editor, Scott Allie who wrote Star Wars: Jedi - The Dark Side, and Douglas Wheatley who provides the interior artwork on Dark Times - Out of the Wilderness #1. In addition to the guests, Tate's Comics also had an exclusive cover for this comic. 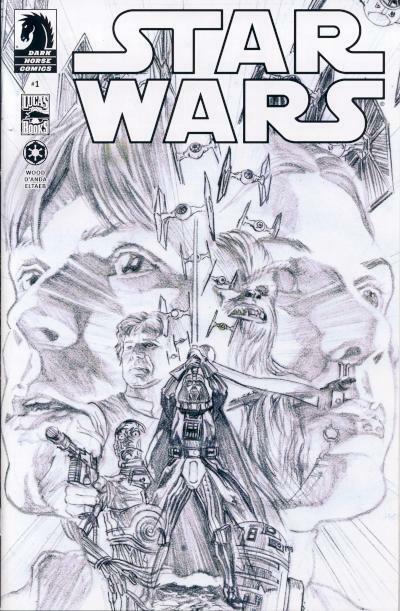 The Tate's Comics exclusive cover also shows Darth Vader. The art is a close-up of Darth Vader's helmet and reflecting in his eyes is the main character of the series, Jedi Master Dass Jennir. When the exclusive cover was first revealed and before many copies showed up on eBay, initial sales for this exclusive were over $100. Many of these covers are signed by Wheatley from the event. There are reports that only 500 units were made, but I'm doubtful that is true. Not only does this comic pop up on eBay from time to time, but Tate's Comics still has copies of this issue for sale. 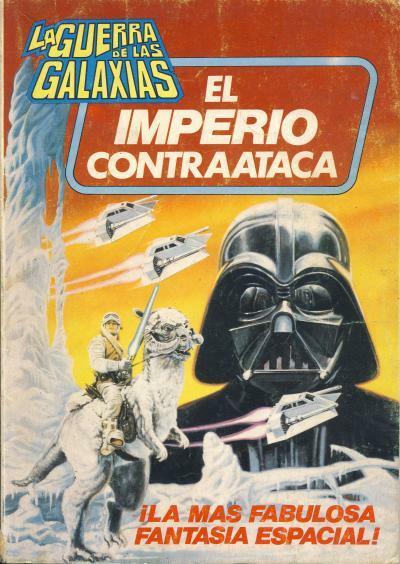 Editorial Bruguera published a trade paperback containing The Empire Strikes Back or el Imperio Contraataca movie adaptation in 1980. This trade paperback is numbered 5, continuing the numbering of the first 4 la Guerra de las Galaxias collections, even though this is not a collection of previously published Spanish language comics. This trade paperback is also smaller than the previous 4 collections, although it is larger than a standard sized comic. 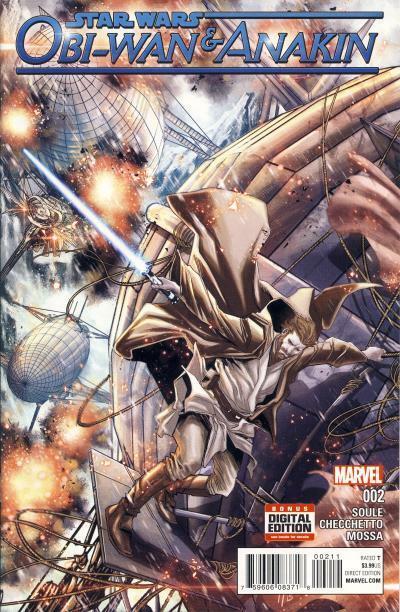 The front cover art is the same used for the Marvel Comics Illustrated Version of The Empire Strikes Back paperback and the Marvel Special Edition #2: The Empire Strikes Back treasury. 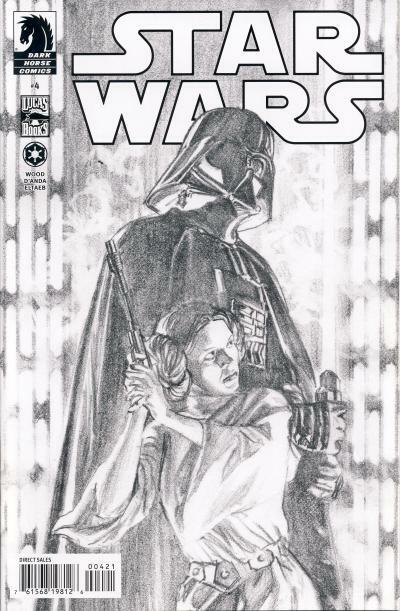 The cover art on the back is the same used on the back of the Marvel Special Edition #2: The Empire Strikes Back treasury. 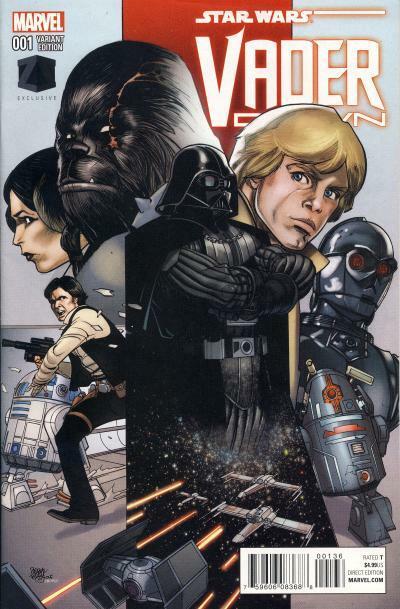 This is the last Star Wars comic published by Editorial Bruguera. 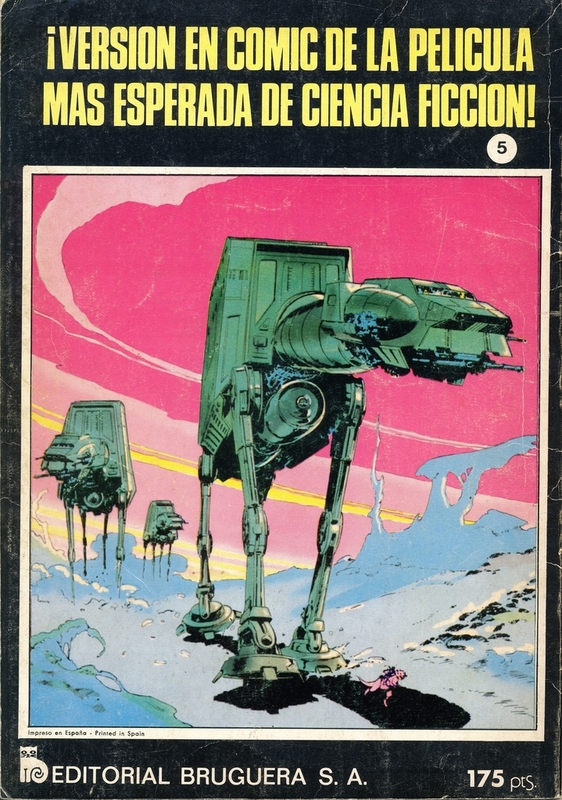 Ediciones Vértice takes over publication of Star Wars comics for Spanish readers in 1981.